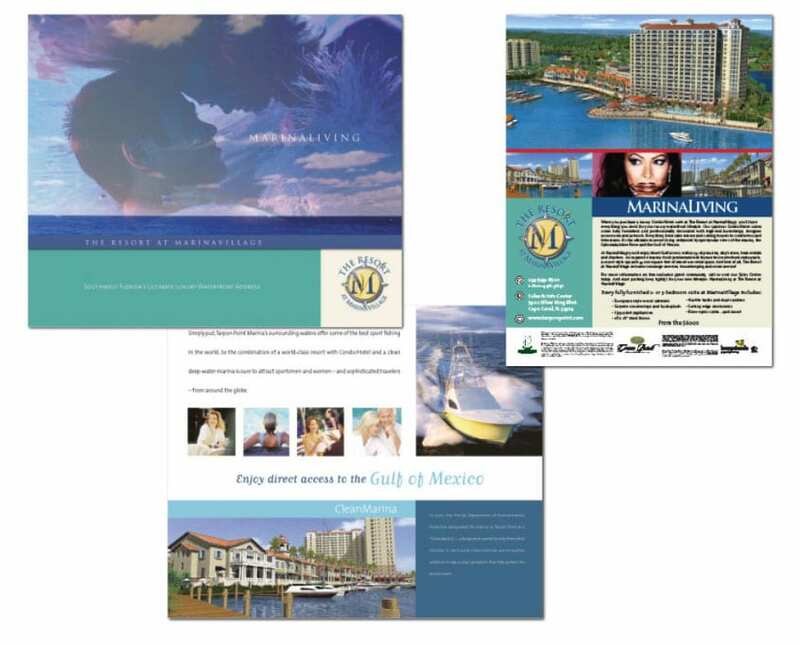 The Resort at Marina Village was a new waterfront high-rise Condo/Hotel concept for Cape Coral, FL. It was fall 2005, and the selling “season” would be over by April. The housing market nationwide was feeling the first effects of a slow down, but Marina Village was being sold in the already very successful and popular luxury community of Tarpon Point Marina. Marketing efforts would need to be focused on a targeted demographic who were still in the market for a luxurious condo in Southwest Florida for a second and third home. Up for sale were 184 Condo/Hotel suites that offered sweeping aquatic views of the Gulf of Mexico in a resort-style community. The client wanted 50 percent of the condos sold in one day. We decided that a mid-January 2006 Saturday afternoon catered lottery event at Tarpon Point would create excitement, anticipation, opportunity and sales contracts among a specific list of invitees. A number of marketing channels and touch points were to be used. Print ads in advance depicted a countdown scenario — “just a few days left and counting.” Real estate agents would be encouraged to attend to represent absent clients by phone. Also, advance public relations activities garnered newspaper articles, and thus interest from potential buyers, the community and news media representatives. A lottery system would be used whereby attendees would have their names pulled from a hat to randomly select who would get the first picks at the best condos. While waiting for names to be called, buyers would for the first time be supplied marketing collaterals to study floor plans and features. As names were called, participants would have two minutes to take their “Sold!” sticker and place it on their desired condo depicted on an architectural drawing of The Resort. The Agency successfully reached its targeted audience: potential home-buyers who just had to be at the event for a once-in-a-lifetime opportunity to secure an elegant Condo/Hotel suite in a luxurious riverfront marina-style community. Despite other events in the city that day — one of which created a detour for our attendees— and rainy and severely windy conditions, more than 500 people showed up from across Southwest Florida. This was a well-qualified audience, and very few, if any, “tire kickers.” Grosse Pointe Development Company reserved nearly 85 percent of the condos at the event.